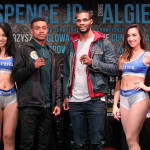 Errol “The Truth” Spence Jr. and Chris Algieri went face-to-face Wednesday to kick-off fight week activities with the final press conference before they meet on NBC this Saturday, April 16 from Barclays Center in Brooklyn. 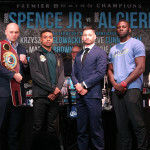 Also in attendance were cruiserweight champion Krzysztof Glowacki and former champion Steven “U.S.S” Cunningham plus undefeated 2012 U.S. Olympian “Sir” Marcus Browne and unbeaten light heavyweight Radivoje “Hot Rod” Kalajdzic who round out a stacked tripleheader on Saturday night. In addition, popular Brooklyn undefeated fighter Heather “The Heat” Hardy was in attendance as she nears her undercard bout against Sweden’s Anna Hultin. “This is a great card with great fighters and its a fantastic opportunity. A lot of people think I’m a prospect on the verge of being a contender. Saturday night is going to be a great performance. “I never thought fight week would come. I’m just so excited to put on a show. 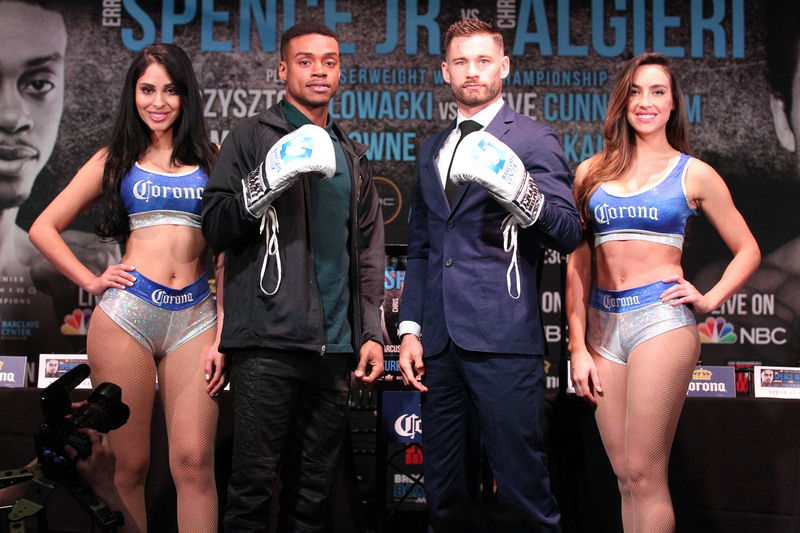 It’s going to be the best Errol Spence you’ve ever seen. “Whatever happens, happens. I’m going to have to feel it out in the first round. I just need to fight smart. “I’ve always felt like I was ready for this level. Saturday night, I’m looking for a coming out party. My focus is 100 percent on this fight. “Brooklyn has treated me very well. I’ve had some of my best performances here at Barclays Center and I look forward to another. “It’s always an honor to share the stage with such illustrious guys in our sport. A lot of these guys really bring honor and respect to the business that we do. “I don’t think I’ve gotten as much respect as I deserve throughout my career. I don’t know why, but it doesn’t really matter. At the end of the day I go out there and perform. More often then not I’m victorious. “The best thing about working with John David Jackson is the confidence he gives me. He let’s me be who I am. He gives me the faith to trust in my abilities. I’m looking forward to putting on another great display with him in my corner. “I’m so happy to be back in the United States and I’d like to thank my team for preparing me so well. “I have to win. That’s the most important thing. It’s nice to be fighting on such a great card, but all that matters is keeping my belt. “Fans can expect to see beautiful boxing. It will be a war inside of the ring. Most importantly, I will win. “A lot of things have changed since I won my world title. Nobody used to know me and now everyone knows me. I’m happy with my career so far. I don’t like to talk about the future of my career until after the fight. “This is my first time fighting at Barclays Center and I’m very excited about that. I’m ready to fight. Training camp is over. You know it’s grueling and hard work. “I know I have a great opponent. He took the belt from the champion. He got up off the canvas so I can’t look at him lightly at all. But I’m here to do a job. “I’m was sick of getting cheated and robbed of opportunities at the heavyweight division. I decided to come back down. It’s no problem. Three pounds or four pounds, no big deal. Here we are. “We are coming to steal the show. I’d like to steal the show without me getting hit too much. A fight is a fight. You know I come to win, so we’re going to have some fun. “There are some adjustments you have to make when you fight a southpaw. A guy throwing two gloves at you and you have to throw gloves back at him. Doesn’t matter if he fights me upside down, I have to fight smart and beat him regardless. “There’s always something special with Naazim Richardson. He’s a great mind. One of the great trainers out there. We’ve always got something special prepared. We have to do what we have to do and that’s win. “When you beat a guy like Marco Huck who was about to make history and you beat him like Glowacki beat him, you have to think he’s good and realize you can’t take Glowacki lightly. He’s a warrior. He’s a problem, something I’m going to have to deal with. “I’m not 40-years-old yet. Give me a few more months! I don’t feel 39 or 40. I feel great. I just want to go in there and perform and do what I do. “We’ve done a lot of talking leading up into this fight. I want to talk with my hands. He said he’s ready to fight. We’ll see on Saturday night. “I feel great. Training camp has gone great. Right now the focus is to win and look good. Whatever happens after that is going to happen. “I’m going to do what I do best and that’s take care of business no matter what. “I’m ready for whatever he brings to the table. We will know that after the first minute of the first round. “It’s an incredible honor to be representing my hometown. Fighting in front my home fans is always very motivating and I can’t wait to put on another show for them. “I’m ready. I don’t have too much to say. I’m just ready to fight. “Training camp went great. We got a full eight weeks in. Roadwork, conditioning, everything. I’m just ready to fight. “I want to introduce myself to the fans by knocking out Marcus Browne. If that doesn’t come, I want to put on a great performance. Being on the big stage doesn’t bother me, once the bell rings its just another day. “I know Marcus is fast and has pop to him. I don’t want to give too much away. “I’m a boxer puncher. I’ve got the power to knock a fighter out. Most of my knockouts have come in the first round. “I’m expecting to face a good strong boxer on Saturday night. She’s coming down in weight to fight me, so don’t miss it. “We changed a little bit during this training camp. I added another conditioning coach. A guy that has been putting me through torture three times a week. “My opponent is strong, she has a good record, she’s from overseas. I know I have my hands full. “It’s a real honor to fight at Barclays Center. I couldn’t ask for a better place. There’s nowhere in the world I’d rather fight than right here at home. As far as my career progressing, I’d like to be up there on stage and be on TV. 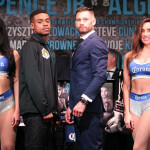 “This great card features a fighter who is believed to be the top prospect in boxing, in Errol Spence Jr. versus New York’s own, a former world champion in Chris Algieri in what promises to be an exciting primetime main event. 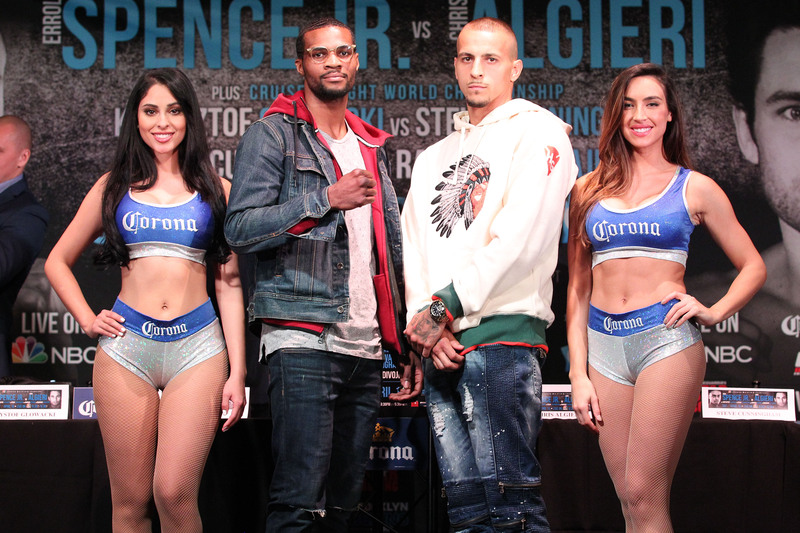 “Marcus Browne has fought more times at Barclays Center than any other professional fighter. He has the chance to make the jump towards a world title by taking out another young undefeated fighter. ‘Hot Rod’ is not planning on letting that happen without serious resistance. 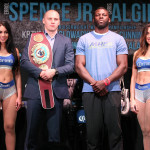 “Glowacki’s fight with Huck was one of the best of last year and he can expect the Polish fans in Brooklyn to be behind him on Saturday night. 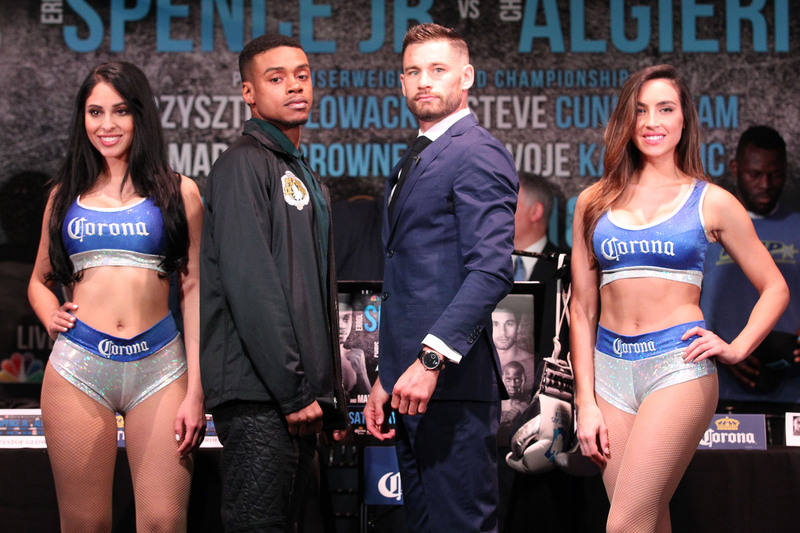 “It’s a pleasure to be back in Brooklyn and to have Chris Algieri fighting at Barclays Center again. It’s very rewarding that he will be in the main event on national television on NBC. It’s a real testament to this fight. “Chris has had some great performances at Barclays Center. He’s going to have another one in front of him on Saturday. 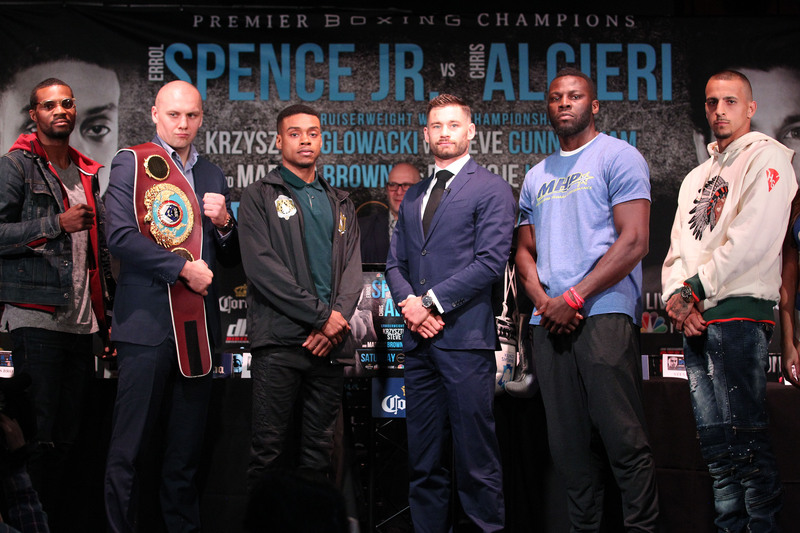 Spence Jr. is a challenge that Chris is looking forward to and one he has faced before. 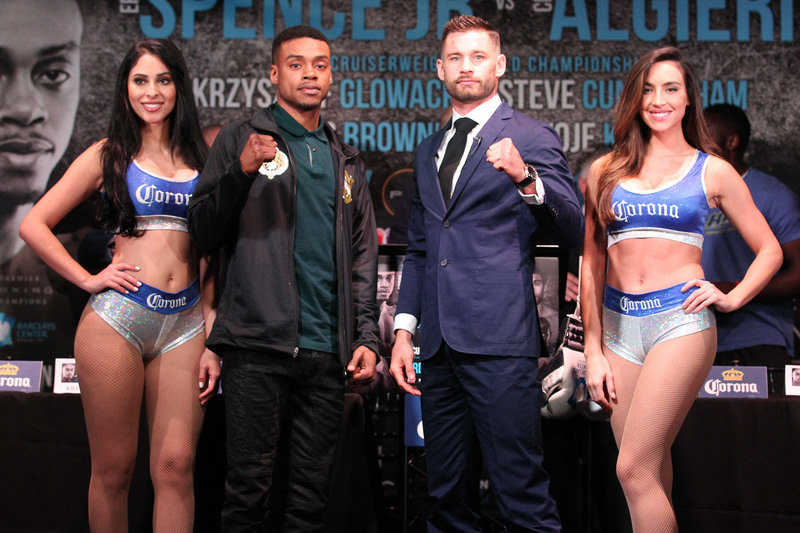 “Barclays Center is thrilled to have Chris Algieri back for his fourth fight and we expect a great turnout from the Long Island fans who are looking forward to Saturday as well. 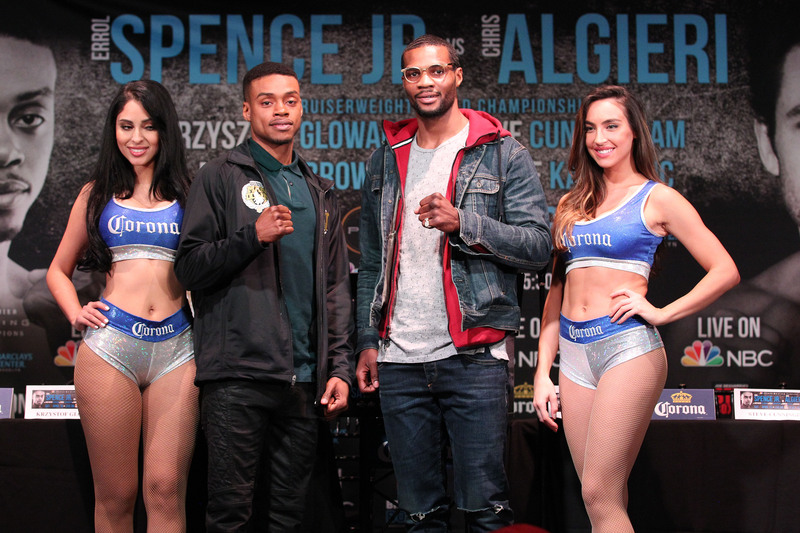 We’re also looking forward to a new name to headline Brooklyn and we welcome Errol Spence Jr.
“We welcome Marcus Browne back for your 11th fight and we thank you for calling Barclays Center home. Heather Hardy is also back at Barclays Center for the sixth time and we are thrilled to have all of them fighting in our building. “It’s fitting that Saturday nights card features Chris Colbert and Earl Newman who got their start at Golden Gloves.